The arrest by British Metropolitan Police of Wikileaks founder Julian Assange, dragged The arrest by British Metropolitan Police of Wikileaks founder Julian Assange, dragged unceremonially out of the Ecuadoran Embassy in London on a charge of failure to appear for a court hearing on an expired (and trumped-up) accusation in Sweden of sexual assault, is a grave and terrible threat to independent journalism and to the US Constitution's First Amendment promise of freedom of the press. Make no mistake. This arrest, made at the UK government's insistence, for "failure to appear" in court for a no longer required hearing on an expired Swedish extradition request to "question him" about a bogus charge of sexual assault, is all a gigantic fraud. At the same time as the arrest was made, and that the Ecuadorian government shamelessly invited UK police into their Embassy to arrest and remove Assange, London Police revealed what has long been known by Assange and his attorneys: that behind it all is the US government, which has for nine years had a secret sealed indictment waiting, an indictment charging Assange with a conspiracy with Army veteran Chelsea Manning to steal and disseminate classified US military documents related to conduct of the Iraq and Afghanistan wars. A US warrant requesting Assange's extradition from the UK to the US was also reportedly issued in 2017. As Glenn Greenwald of the Intercept, who worked with Assange and Wikileaks in reporting on NSA whistleblower Edward Snowden to help Snowden escape US arrest and win asylum in Russia, tweeted early this morning, "If you're cheering Assange's arrest based on a US extradition request, your allies in your celebration are the most extremist elements of the Trump administration, whose primary and explicit goal is to criminalize reporting on classified docs & punish (Wikileaks) for exposing war crimes. 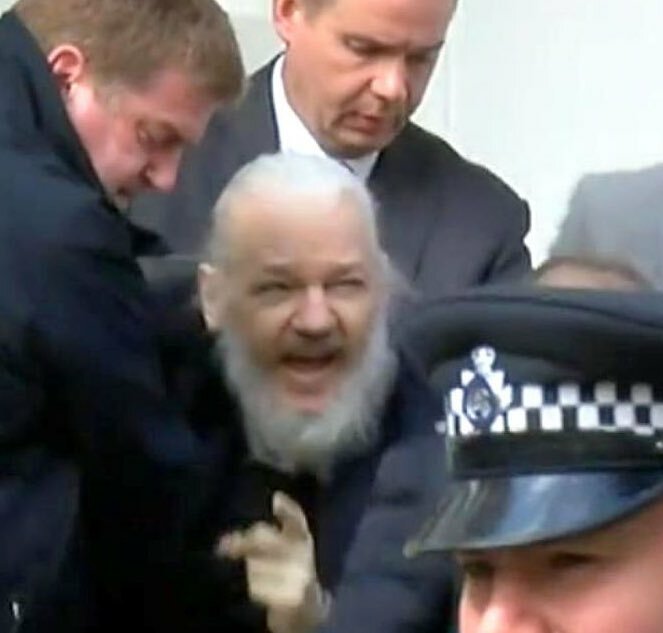 As well, during his seven years holed up in the tiny Ecuadorian Embassy, which is actually just one floor of an apartment building in a swanky part of London, the US brought intense pressure, including economic threats, against Ecuador trying to get the little Latin American nation to revoke the asylum offer granted to Assange by Correa"